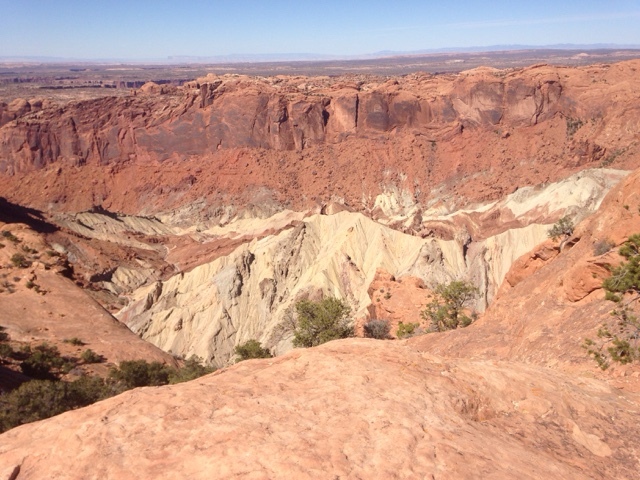 I visited Canyon Lands NPlast year about the same time of year. The park consists of a north and a south area that are not connected with roads in the park. 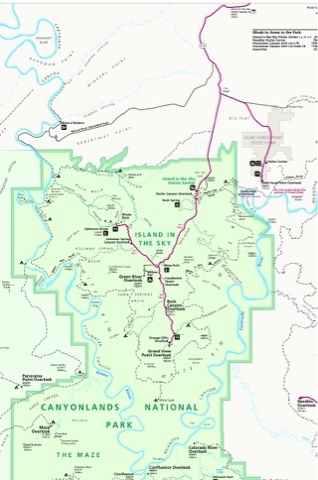 The map, above, shows the two sections of the park with the red lines indicating the major park roads. My visit to the park was to the northern part, as was my previous visit. I have never been to the southern part of the park. Entering the park brings you in on a plateau, where the major park roads stay. The main road is north and south and another road west is off this road. See map above. 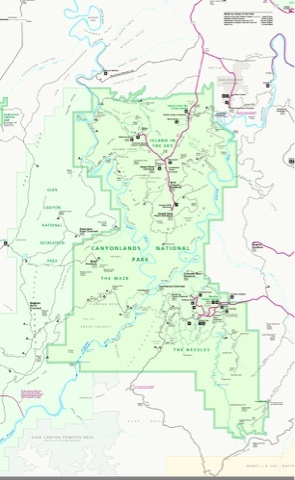 The park roads have turnouts to view various scenic overlooks or rock features. 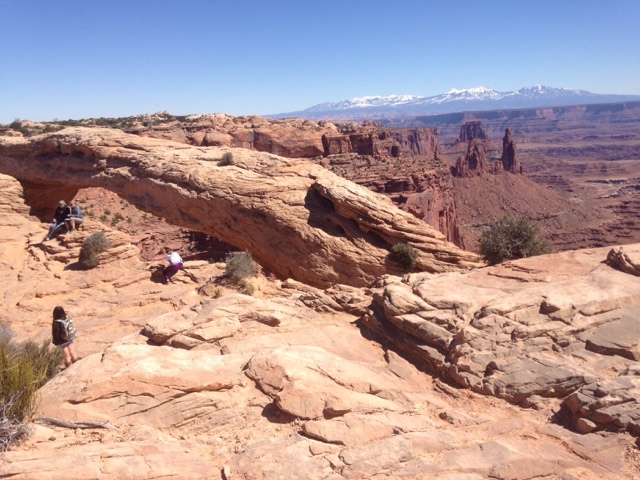 The picture above is Mesa Arch. It takes but a few minutes to walk the approx 1/2 mile trail but it is not level. 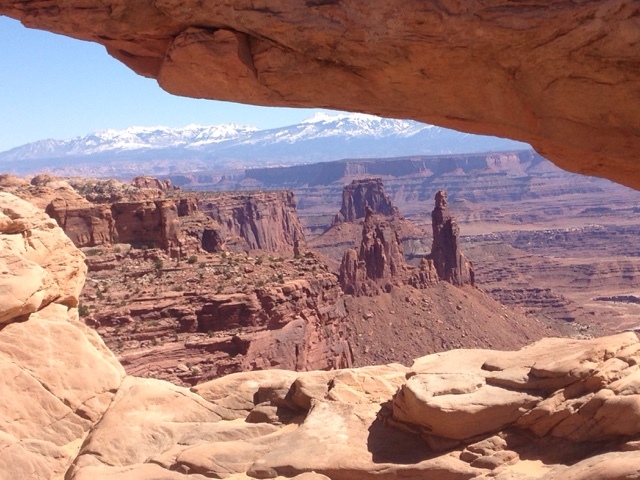 My picture above is focused on the view through the arch rather than the arch its self. Here is the arch. Where you see the person below the arch is at the edge of the canyon wall with about a 1000 foot drop to the canyon floor. 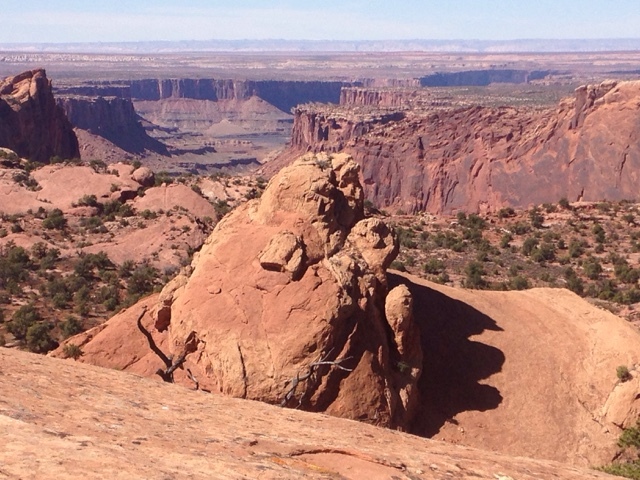 As I mentioned, the paved park roads are high on a mesa / plateau and the scenery comes from looking to the canyon below. There are plenty of different places to look into the canyon below. Here is an inverted dome that isn't known what exactly caused it. It is about a half mile walk in from the trailhead to the rim of the sunken dome where I took the picture. The two popular beliefs is that it could be a salt foam pushed up from under the rock, or a meteor that impacted the earth and the salt material below came up out of the ground. It is said that the answer is under the foam that can't be explored. 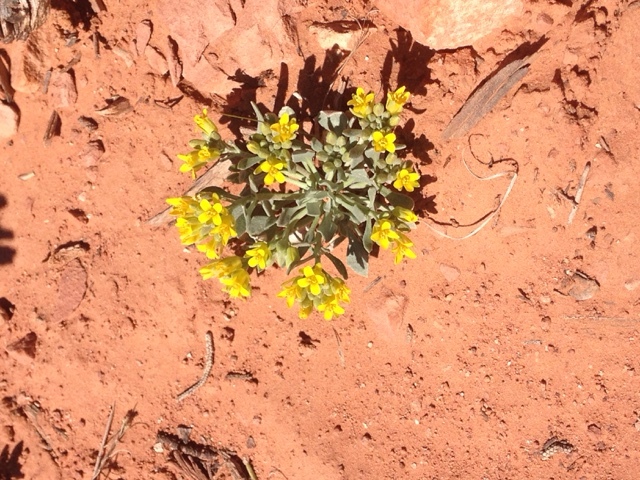 Here is on of a few flowers I found on a park trail. I had mentioned above that there are two sections of the park, one being the north and the other being the south. The picture above is of the lower plateau where this off-road is. 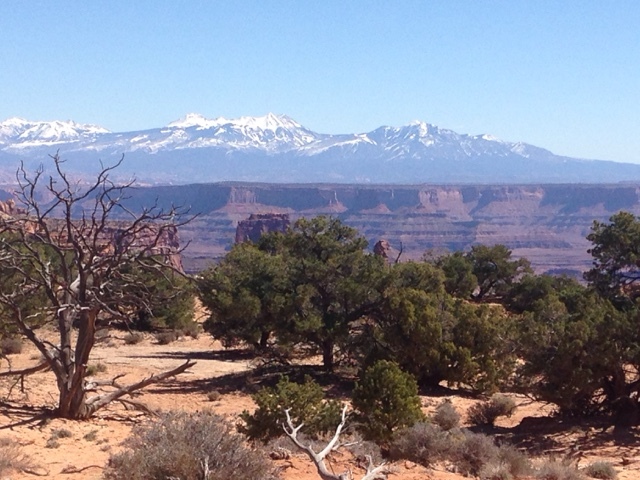 If you look to the left of the lower rim this 100 mile dirt road passes past the rim at this point. You can take your personal off-road vehicle on this road and there are campsites along this route where you can stay. This is a very popular activity to do, but it comes with cautions and risks outlined on the website above. 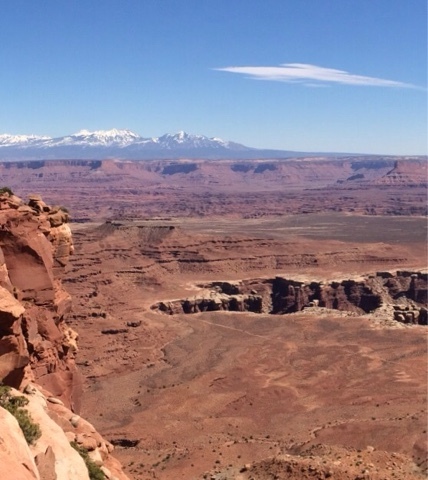 Another popular activity is hiking down the plateau walls to the lower plateau and camp. Trailheads for parking are along the plateau rim. 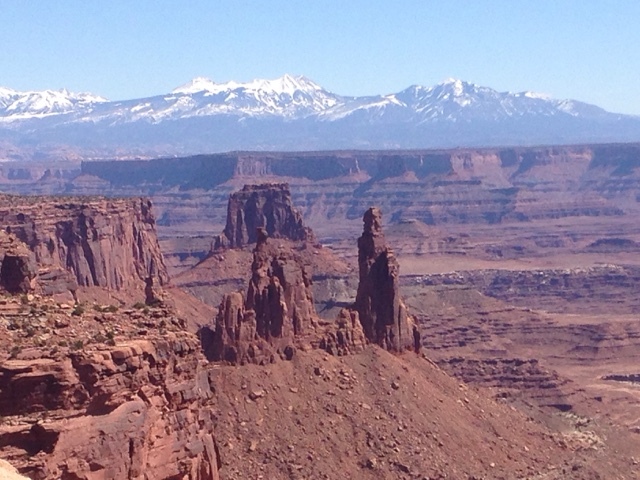 A return trip I may consider an off-road tour available at a number of places in Moab. A hike down the canyon needs to be planned to start early in the day as the hike down to the lower plateau is about a thousand foot change in elevation.